Are you ready to find out who you really are? There are 25 questions in the quiz, and after answering all of these questions, you will finally be able to determine your color personality! If you're ready to find out who you really are, take this quiz now! Which of the following activities do you enjoy doing the most? It's the middle of October and your friend is throwing the ultimate Halloween party, what type of costume are you going to be wearing? Let's say your friends invited you to a birthday party, but you had absolutely nothing presentable to wear! What do you do? Run to the mall as quick as possible! Wear what I have and hope for the best. No time, I am already ready as soon as I get out of bed. What is your favorite type of pet? On a scale from 0-10, how physically attractive do you consider yourself to be? Which of the following selections describes how you feel about country music? Country music makes me sad, so I prefer not to listen to it. Country music is okay, depending on what the song is. To be a website designer. To be a fashion designer. To be a police officer. What is/was your place in school? 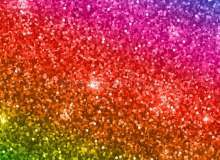 Would you ever consider decorating your room in glitter? Which of the following states do you want to visit the most? Which of the following phrases describes your personality the most? "I love wearing colors that sparkle!" "I hate being the center of attention, because what if I make a mistake and embarrass myself?" "Money is something that I need to have on me at all times, otherwise I wouldn't feel right." "I love sewing, because it makes me feel good to make my own article of clothing!" "I am the type of person who is generally angry if things don't always go my way." "Makeup and good fashion are two things that I can not be seen without!" "Bullying other people actually makes me feel great about myself!" "Food is the only thing that makes me happy." Which of the following phrases describes how you feel about school? "I like going to certain classes that my friends or crushes are in, but I hate learning!" "I like certain classes in school, but some classes are pointless." "School should only be mandatory only up to about 5th grade." "There are only one or two classes that I like in school." "I only like school when there's somebody there to entertain me." "School is very important and I study hard for all of my tests!" I am the shyest person that I know and it is very easy for me to embarrass myself! I am very shy, but only around strangers. It goes about half and half for me, depending on my day. I could be a social butterfly one day, but bashful the next. I am not shy at all! I am the complete opposite of shy! Which of the following phrases describes your place when attending a party? "At a party, I am always chatty and outgoing; I just love talking to people!" "At a party, I am the one who is hiding awkwardly in the corner." "At a party, I am the one who is always getting hit on by the opposite gender." "I do not get invited to parties." I shower once a day. I shower at least twice a day. I shower once every other day. I shower about once a week. I shower less than once a week. What comes first, yourself or other people? Agree or Disagree; I will go out of my way to make other people happy! Agree or Disagree; I have extremely high self esteem! Which of the following words describes your personality the most? Quiz topic: Which Color Describes my Personality?